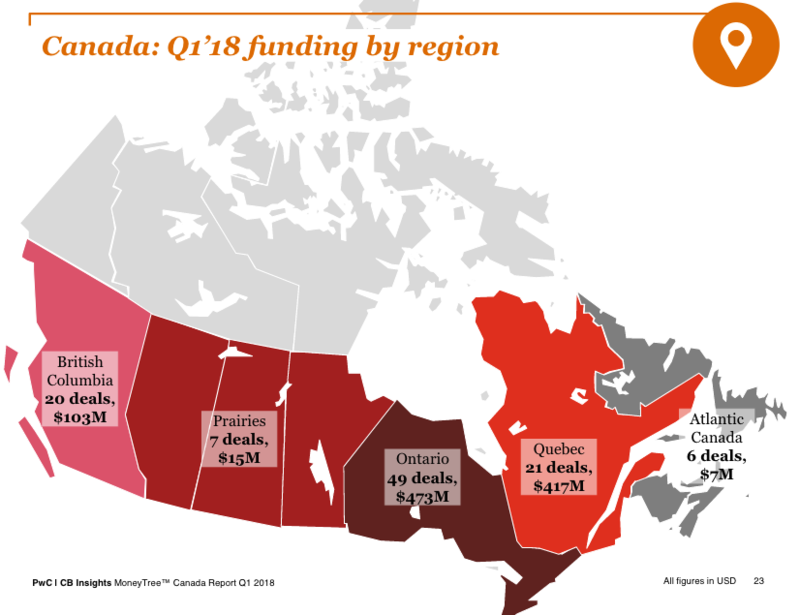 According to PwC Canada and CB Insights’ latest MoneyTree report, total venture capital funding to Canadian tech companies in Q1 2018 increased 52 percent, with $1.28 billion ($1 billion USD) invested. 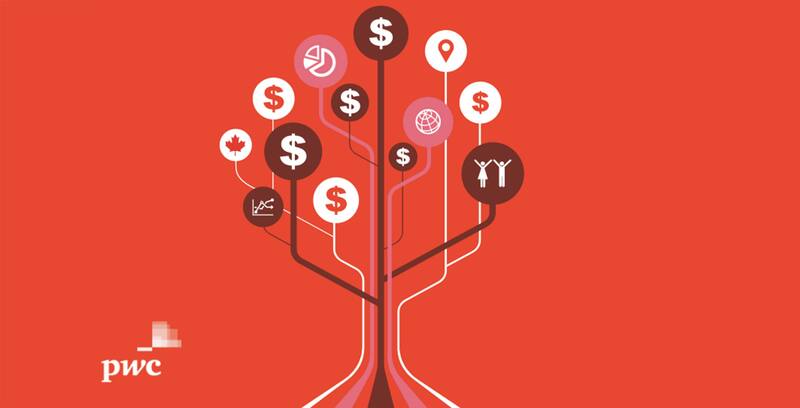 MoneyTree examines all Canadian venture capital activity for the past quarter, including deal flow and dollars, broken down by sector, city, and stage. According to the report, Q1’s 105 deals represents a 30 percent quarterly increase in deal activity since Q4 2017. According to PwC, this $1.28 billion amount is the largest seen since CB Insights began collecting MoneyTree data in 2012, with the second highest prior quarter being Q3 2015, when $997 million USD was raised across 64 deals. Numbers from investing platform Crowdmatrix indicate that this could be the largest amount of investment since at least 1999, which saw $2.7 billion in financing for the year. Corporate participation in investment, which was one of the major themes of last year due to reaching an eight-quarter high in Q2 2017, slightly declined this year. In Q1 2018, 28 percent of all deals to Canadian companies featured at least one corporate or corporate venture capital investor — down from 30 percent in Q4 2017. However, Michael Dingle, National Deals Technology Leader at PwC, indicated that this slight decrease wasn’t a cause for concern, especially when considering other factors that show the health of corporate participation. Four of the top five deals this quarter involved corporates and/or corporate venture capital, and the report’s only identified mega-round this quarter — Montreal-based Enerkem raising $287 million ($224 million USD) — was led by a Canadian corporate investor. Another takeaway to note is that 60 percent of corporate venture capital (CVC) investment this quarter came from non-Canadian investors (a continuation from last year, which saw a marked in Asian investments). Sixty-nine percent of the corporates and CVCs that invested in Canada this quarter made their first Canadian investment. Speaking with BetaKit, Dingle indicated that attracting global capital could represent international product validation for Canadian companies, while also giving them connectivity to another market. In 2017, AI and FinTech were two of the hottest sectors for investment, with FinTech seeing $566 million CAD ($456 million USD) and AI hitting $312 million CAD ($252 million USD) that year. Q1 2018 saw AI investment increase by 88 percent with $106 million ($83 million USD) invested across eight deals — though this was notably lower than the $204 million ($159 million USD) invested in Canadian AI in Q2 2017 that included Element AI’s massive funding round. Removing Element AI’s outsized round, the deal value for Q2 2017 declines to $73 million CAD ($57 million USD), and the past eight quarters show a steady increase for companies in this sector. Canadian FinTech companies received $112 million USD ($88 million CAD) invested across eight deals in Q1 2018, a 60 percent decline in total funding over Q4 2017. PwC noted, however, that FinTech’s total quarterly funding in Q4 2017 was driven by Lightspeed’s $207 million CAD funding round, and once removed from consideration, Q4 2017 drops to $104 million ($81 million USD), a number consistent with Q1 2018. Digital health was a sector called out for “rebounding,” jumping from just one deal in Q4 2017 to six in Q1 2018, while total quarterly financing reached $28 million ($22 million USD) for the quarter. In healthcare, companies received $161 million ($126 million USD) invested across 10 deals. Deal activity was suppressed compared to Q3 2017’s 19 deals — a quarter that pushed PwC to call healthtech a sector to watch for 2018. Healthcare deal share declined to 10 percent of total deal activity, down from 14 percent in Q4 2017, but total quarterly funding increased by 66 percent. Toronto, Montreal, and Vancouver continued to be leading cities for investment, with 38, 20, and 16 deals respectively. 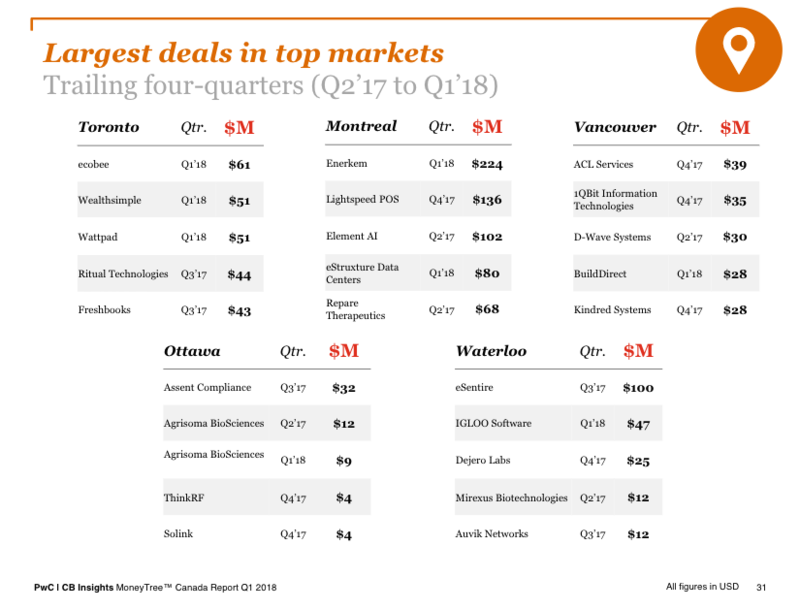 While Montreal had only 16 deals, it also surpassed Toronto’s $412 million ($321 million USD) investment with $512 million ($399 million USD) invested in Q1 2018, the highest of the top five cities. Canadian investors were most active in seed-stage and later-stage funding, with both hovering at 61 percent Canadian participation, while Canadian investors represented over half of all investors in Canada-headquartered companies at all stages of investment. PwC’s Dingle said that increased investment from Canadian VCs is a sign of the country’s deepening capital pools.